What is the Difference Between Non-Reactive and Reactive Cookware? Understanding what it means when some cookware is said to be "reactive", and some are said to be "non-reactive" is a simple lesson in chemistry. Foods that are acidic, such as tomatoes or foods that contain lemon juice or vinegar, should not be cooked in reactive cookware. Aluminum, copper, iron, and non-stainless steel are reactive cookware. Their surfaces will release atoms of metal into the food and can give the food an off taste or discoloration. Acidic foods pull these atoms of metal from pans that are made of materials that are susceptible to releasing their atoms. Non-reactive cookware is made of stainless steel, glass, or glazed ceramic. Or it might be coated with something that is nonreactive, like the enamel in enamelware and enamel coated iron pots. So why bother with reactive metals in making cookware at all? 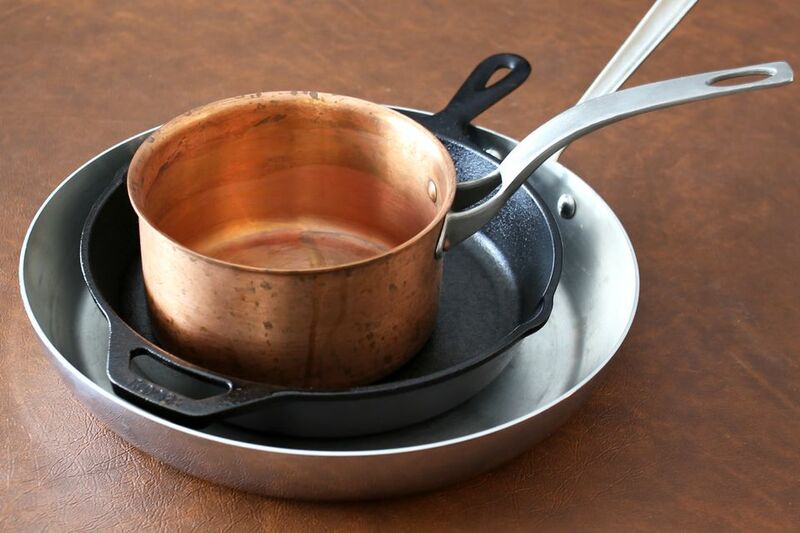 There are some ways in which cookware made from reactive substances is better, mainly the fact that aluminum and copper and iron heat more uniformly without "hot spots." So, compromises have been developed. Enamelware is usually made by coating a reactive metal pan with non-reactive enamel. As a result, you get a pan that heats more evenly, yet does not react with acidic foods. Aluminum may be anodized which means it is chemically coated with a layer of non-reactive oxide. Reactive copper pans are sometimes lined with non-reactive tin. These substances hold tight to their atoms and release much less of them into cooking foods even if the foods are acidic. They make a barrier between the acid of the food and the reactive metal of the pan. The problem with these is that we often use metal spoons, spatulas, and other utensils in them, which can scratch through the non-reactive enamel, aluminum oxide, or tin to the reactive metal. Once that barrier is broken, then the protection is gone. Cast iron is considered to be reactive, but the quick cooking of acidic foods in a well-seasoned cast iron pan doesn't usually cause any problems. Ingested iron is usually much less harmful than ingested aluminum or copper. A non-reactive but poorly heating stainless steel pan may be copper clad on the bottom to make it a better conductor of heat. Glass is one of the most non-reactive substances that can be used for cookware, but it is a poor conductor of heat. This is also the reason that reactive aluminum food cans are lined with non-reactive plastic. Even though there is little heating involved, the aluminum can get into the food because of the long-term contact. You may have heard that these plastic liners often contain BPA, which many studies have shown to be harmful when ingested. This is particularly a problem with acidic tomato products, and manufacturers are looking for a lining that does not use BPA-containing plastic.